For current liturgical language, see Church Slavonic. "Old Bulgarian" redirects here. For the extinct Turkic language, see Bulgar language. Old Church Slavonic or Old Slavonic (/sləˈvɒnɪk/, /slæˈ-/), also known as Old Church Slavic or Old Slavic (/ˈslɑːvɪk, ˈslæv-/), was the first Slavic literary language (autonym словѣ́ньскъ ѩꙁꙑ́къ, slověnĭskŭ językŭ). It is also referred to as Paleo-Slavic (Paleoslavic) or Palaeo-Slavic (Palaeoslavic), not to be confused with the Proto-Slavic. It is often abbreviated to OCS. The 9th-century Byzantine missionaries Saints Cyril and Methodius are credited with standardizing the language and using it in translating the Bible and other Ancient Greek ecclesiastical texts as part of the Christianization of the Slavs. It is thought to have been based primarily on the dialect of the 9th century Byzantine Slavs living in the Province of Thessalonica (now in Greece). It played an important role in the history of the Slavic languages and served as a basis and model for later Church Slavonic traditions, and some Eastern Orthodox and Eastern Catholic churches use this later Church Slavonic as a liturgical language to this day. As the oldest attested Slavic language, OCS provides important evidence for the features of Proto-Slavic, the reconstructed common ancestor of all Slavic languages. The language was standardized for the mission of the two apostles to Great Moravia (the territory of today's western Slovakia and Czech Republic; see Glagolitic alphabet for details). For that purpose, Cyril and his brother Methodius started to translate religious literature to Old Church Slavonic, allegedly based on the Slavic dialects spoken in the hinterland of their hometown, Thessaloniki, in today's Greece. The language and the alphabet were taught at the Great Moravian Academy (Slovak: Veľkomoravské učilište) and were used for government and religious documents and books between 863 and 885. The texts written during this phase contain characteristics of the Slavic vernaculars in Great Moravia. In 885, the use of Old Church Slavonic in Great Moravia was prohibited by Pope Stephen V in favour of Latin. Students of the two apostles, who were expelled from Great Moravia in 886, brought the Glagolitic alphabet to the First Bulgarian Empire. There it was taught at two literary schools: the Preslav Literary School and the Ohrid Literary School. The Glagolitic alphabet was originally used at both schools, though the Cyrillic script was developed early on at the Preslav Literary School where it superseded Glagolitic. The texts written during this era exhibit certain linguistic features of the vernaculars of the First Bulgarian Empire. Old Church Slavonic spread to other South-Eastern, Central, and Eastern European Slavic territories, most notably Croatia, Serbia, Bohemia, Lesser Poland, and principalities of the Kievan Rus' while retaining characteristically South Slavic linguistic features. Later texts written in each of those territories then began to take on characteristics of the local Slavic vernaculars and, by the mid-11th century, Old Church Slavonic had diversified into a number of regional varieties (known as recensions). These local varieties are collectively known as the Church Slavonic language. Apart from the Slavic countries, Old Church Slavonic has been used as a liturgical language by the Romanian Orthodox Church, as well as a literary and official language of the princedoms of Wallachia and Moldavia (see Old Church Slavonic in Romania), before gradually being replaced by Romanian during the 16th to 17th centuries. Church Slavonic maintained a prestigious status, particularly in Russia, for many centuries – among Slavs in the East it had a status analogous to that of Latin in Western Europe, but had the advantage of being substantially less divergent from the vernacular tongues of average parishioners. Some Orthodox churches, such as the Bulgarian Orthodox Church, Russian Orthodox Church, Serbian Orthodox Church, Ukrainian Orthodox Church and Macedonian Orthodox Church – Ohrid Archbishopric, as well as several Eastern Catholic Churches, still use Church Slavonic in their services and chants today. Initially Old Church Slavonic was written with the Glagolitic alphabet, but later Glagolitic was replaced by Cyrillic, which was developed in the First Bulgarian Empire by a decree of Boris I of Bulgaria in the 9th century. The local Bosnian Cyrillic alphabet, known as Bosančica, was preserved in Bosnia and parts of Croatia, while a variant of the angular Glagolitic alphabet was preserved in Croatia. See Early Cyrillic alphabet for a detailed description of the script and information about the sounds it originally expressed. For Old Church Slavonic, the following segments are reconstructible. A few sounds are given in Slavic transliterated form rather than in IPA, as the exact realisation is uncertain and often differs depending on the area that a text originated from. The letter щ denoted different sounds in different dialects and is not shown in the table. In Bulgaria, it represented the sequence /ʃt/, and it is normally transliterated as št for that reason. Farther west and north, it was probably /c(ː)/ or /tɕ/ like in modern Macedonian, Torlakian and Serbian/Croatian. /dz/ appears mostly in early texts, becoming /z/ later on. The distinction between l, n and r, on one hand, and palatal l', n' and r', on the other, is not always indicated in writing. When it is, it is shown by a palatization diacritic over the letter: л҄ н҄ р҄. Accent is not indicated in writing and must be inferred from later languages and from reconstructions of Proto-Slavic. The pronunciation of yat (ѣ/ě) differed by area. In Bulgaria it was a relatively open vowel, commonly reconstructed as /æ/, but further north its pronunciation was more closed and it eventually became a diphthong /je/ (e.g. in modern standard Croatian) or even /i/ in many areas (e.g. in Chakavian Croatian, Shtokavian Ikavian Croatian dialects or Ukrainian) or /e/ (modern standard Serbian). The yer (ь) and (ъ) vowels ĭ and ŭ are often called "ultrashort" and were lower, more centralised and shorter than their counterparts i and y/u. They disappeared in most positions in the word, already sporadically in the earliest texts but more frequently later on. They also tended to merge with other vowels, particularly ĭ with e and ŭ with o, but differently in different areas. The exact articulation of the nasal vowels is unclear because different areas tend to merge them with different vowels. ę /ɛ̃/ is occasionally seen to merge with e or ě in South Slavic, but becomes ja early on in East Slavic. ǫ /ɔ̃/ generally merges with u or o, but in Bulgaria, ǫ was apparently unrounded and eventually merged with ŭ. The back vowels /y/ and /ъ/ as well as front vowels other than /i/ do not occur word-initially: the two back vowels take prothetic /v/ and the front vowels prothetic /j/. Initial /a/ may take either prothetic consonant or none at all. As a result of the first and the second Slavic palatalizations, velars alternate with dentals and palatals. In addition, as a result of a process usually termed iotation (or iodization), velars and dentals alternate with palatals in various inflected forms and in word formation. In some forms the alternations of /c/ with /č/ and of /dz/ with /ž/ occur, in which the corresponding velar is missing. The dental alternants of velars occur regularly before /ě/ and /i/ in the declension and in the imperative, and somewhat less regularly in various forms after /i/, /ę/, /ь/ and /rь/. The palatal alternants of velars occur before front vowels in all other environments, where dental alternants do not occur, as well as in various places in inflection and word formation described below. As a result of earlier alternations between short and long vowels in roots in Proto-Indo-European, Proto-Balto-Slavic and Proto-Slavic times, and of the fronting of vowels after palatalized consonants, the following vowel alternations are attested in OCS: /ь/ : /i/; /ъ/ : /y/ : /u/; /e/ : /ě/ : /i/; /o/ : /a/; /o/ : /e/; /ě/ : /a/; /ъ/ : /ь/; /y/ : /i/; /ě/ : /i/; /y/ : /ę/. Vowel:∅ alternations sometimes occurred as a result of sporadic loss of weak yer, which later occurred in almost all Slavic dialects. The phonetic value of the corresponding vocalized strong jer is dialect-specific. As an ancient Indo-European language, OCS has a highly inflective morphology. Inflected forms are divided in two groups, nominals and verbs. Nominals are further divided into nouns, adjectives and pronouns. Numerals inflect either as nouns or pronouns, with 1-4 showing gender agreement as well. Nominals can be declined in three grammatical genders (masculine, feminine, neuter), three numbers (singular, plural, dual) and seven cases: nominative, vocative, accusative, instrumental, dative, genitive, and locative. There are five basic inflectional classes for nouns: o/jo-stems, a/ja-stems, i-stems, u-stems and consonant stems. Forms throughout the inflectional paradigm usually exhibit morphophonemic alternations. Adjectives are inflected as o/jo-stems (masculine and neuter) and a/ja-stems (feminine), in three genders. They could have short (indefinite) or long (definite) variants, the latter being formed by suffixing to the indefinite form the anaphoric third-person pronoun jь. Synthetic verbal conjugation is expressed in present, aorist and imperfect tenses while perfect, pluperfect, future and conditional tenses/moods are made by combining auxiliary verbs with participles or synthetic tense forms. Sample conjugation for the verb vesti "to lead" (underlyingly ved-ti) is given in the table below. Sample conjugation of the verb vesti "to lead"
Written evidence of Old Church Slavonic survives in a relatively small body of manuscripts, most of them written in First Bulgarian Empire during the late 10th and the early 11th centuries. The language has a Southern Slavic basis with an admixture of Western Slavic features inherited during the mission of Saints Cyril and Methodius to Great Moravia (863–885). The only well-preserved manuscript of the Moravian recension, the Kiev Folia, is characterised by the replacement of some Southern Slavic phonetic and lexical features with Western Slavic ones. Manuscripts written in the Second Bulgarian Empire (1185-1396) have, on the other hand, few Western Slavic features. Old Church Slavonic is also likely to have preserved an extremely archaic type of accentuation (probably close to the Chakavian dialect of modern Serbo-Croatian), but unfortunately, no accent marks appear in the written manuscripts. morphosyntactic use of the dative possessive case in personal pronouns and nouns: 'рѫка ти' (rǫka ti, "your hand"), 'отъпоущенье грѣхомъ' (otŭpuštenĭje grěxomŭ, "remission of sins"); periphrastic future tense using the verb 'хотѣти' (xotěti, "to want"); use of the comparative form 'мьнии' (mĭniji, "smaller") to denote "younger". morphosyntactic use of suffixed demonstrative pronouns 'тъ, та, то' (tŭ, ta, to). In Bulgarian and Macedonian these developed into suffixed definite articles. The existence of /ʃt/ and /ʒd/ as reflexes of Proto-Slavic *ť (< *tj and *gt, *kt) and *ď (< *dj). Use of possessive dative for personal pronouns and nouns, as in 'братъ ми' (bratŭ mi, "my brother"), 'рѫка ти' (rǫka ti, "your hand"), 'отъпоущенье грѣхомъ' (otŭpuštenĭje grěxomŭ, "remission of sins"), 'храмъ молитвѣ' (xramŭ molitvě, 'house of prayer'), etc. Periphrastic compound future tense formed with the auxiliary verb 'хотѣти' (xotěti, "to want"), for example 'хоштѫ писати' (xoštǫ pisati, "I will write"). The language was standardized for the first time by the mission of the two apostles to Great Moravia from 863. The manuscripts of the Moravian recension are therefore the earliest dated of the OCS recensions. [clarification needed] The recension takes its name from the Slavic state of Great Moravia which existed in Central Europe during the 9th century on the territory of today's western Slovakia and Czech Republic. Use of the words mьša, cirky, papežь, prěfacija, klepati, piskati etc. Old Church Slavonic language is developed in the First Bulgarian Empire and was taught in Preslav (Bulgarian capital between 893 and 972), and in Ohrid (Bulgarian capital between 991/997 and 1015). It did not represent one regional dialect but a generalized form of early eastern South Slavic, which cannot be localized. The existence of two major literary centres in the Empire led in the period from the 9th to the 11th centuries to the emergence of two recensions (otherwise called "redactions"), termed "Bulgarian" and "Macedonian" respectively. Some researchers do not differentiate between manuscripts of the two recensions, preferring to group them together in a "Macedo-Bulgarian" or simply "Bulgarian" recension. Others, as Horace Lunt, have changed their opinion with time. In the mid-1970s, Lunt held that the differences in the initial OCS were neither great enough nor consistent enough to grant a distinction between a 'Macedonian' recension and a 'Bulgarian' one. A decade later, however, Lunt argued in favour of such a distinction, illustrating his point with paleographic, phonological and other differences. The development of Old Church Slavonic literacy had the effect of preventing the assimilation of the South Slavs into neighboring cultures, which promoted the formation of a distinct Bulgarian identity. The Glagolitic and Cyrillic alphabets were used concurrently. In some documents the original supershort vowels ъ and ь merged with one letter taking the place of the other. The original ascending reflex (rь, lь) of syllabic /r/ and /l/ was sometimes metathesized to ьr, ьl; or a combination of the ordering was used. The central vowel ы y merged with ъи ъi. Sometimes the use of letter ⟨Ѕ⟩ (/dz/) was merged with that of ⟨З⟩ (/z/). The verb forms нарицаѭ, нарицаѥши (naricajǫ, naricaješi) were substituted or alternated with наричꙗѭ, наричꙗеши (naričjajǫ, naričjaješi). Later use of the language in a number of medieval Slavic polities resulted in the adjustment of Old Church Slavonic to the local vernacular, though a number of Southern Slavic, Moravian or Bulgarian features also survived. Significant later recensions of Old Church Slavonic (referred to as Church Slavonic) in the present time include: Slovene, Croatian, Serbian and Russian. In all cases, denasalization of the yuses occurred; so that only Old Church Slavonic, modern Polish and some isolated Bulgarian dialects retained the old Slavonic nasal vowels. Due to the Ottoman conquest of Bulgaria in 1396, Serbia saw an influx of educated scribes and clergy who re-introduced a more classical form, closer resembling the Bulgarian recension. The line between OCS and post-OCS manuscripts is arbitrary, and terminology varies. The common term "Middle Bulgarian" is usually contrasted to "Old Bulgarian" (an alternative name for Old Church Slavonic), and loosely used for manuscripts whose language demonstrates a broad spectrum of regional and temporal dialect features after the 11th century. The Bosnian recension used the Bosnian Cyrillic alphabet (better known as Bosančica) and the Glagolitic alphabet. PSl. weak-positioned yers *ъ and *ь in merged, probably representing some schwa-like sound, and only one of the letters was used (usually 'ъ'). Evident in earliest documents like Baška tablet. The core corpus of Old Church Slavonic manuscripts is usually referred to as canon. Manuscripts must satisfy certain linguistic, chronological and cultural criteria to be incorporated into the canon: they must not significantly depart from the language and tradition of Sts. Cyril and Methodius, usually known as the Cyrillo-Methodian tradition. For example, the Freising Fragments, dating from the 10th century, show some linguistic and cultural traits of Old Church Slavonic, but they are usually not included in the canon, as some of the phonological features of the writings appear to belong to certain Pannonian Slavic dialect of the period. Similarly, the Ostromir Gospels exhibits dialectal features that classify it as East Slavic, rather than South Slavic so it is not included in the canon either. On the other hand, the Kiev Missal is included in the canon even though it manifests some West Slavic features and contains Western liturgy because of the Bulgarian linguistic layer and connection to the Moravian mission. and the power and the glory unto the ages of ages. The history of Old Church Slavonic writing includes a northern tradition begun by the mission to Great Moravia, including a short mission in the Balaton principality, and a Bulgarian tradition begun by some of the missionaries who relocated to Bulgaria after the expulsion from Great Moravia. Old Church Slavonic's first writings, translations of Christian liturgical and Biblical texts, were produced by Byzantine missionaries Saint Cyril and Saint Methodius, mostly during their mission to Great Moravia. The most important authors in Old Church Slavonic after the death of Methodius and the dissolution of the Great Moravian academy were Clement of Ohrid (active also in Great Moravia), Constantine of Preslav, Chernorizetz Hrabar and John Exarch, all of whom worked in medieval Bulgaria at the end of the 9th and the beginning of the 10th century. The Second Book of Enoch was only preserved in Old Church Slavonic, although the original most certainly had been Greek or even Hebrew or Aramaic. 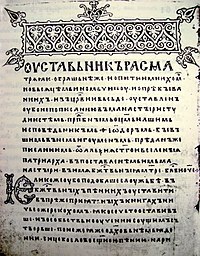 The name of the language in Old Church Slavonic texts was simply Slavic (словѣ́ньскъ ѩꙁꙑ́къ, slověnĭskŭ językŭ), derived from the word for Slavs (словѣ́нє, slověne), the self-designation of the compilers of the texts. This name is preserved in the modern names of the Slovak and Slovene languages. The language is sometimes called Old Slavic, which may be confused with the distinct Proto-Slavic language. Different strains of nationalists have tried to 'claim' Old Church Slavonic; thus OCS has also been variously called "Old Bulgarian", "Old Croatian", "Old Macedonian", or "Old Serbian", or even "Old Slovak", "Old Slovenian". The commonly accepted terms in modern English-language Slavic studies are Old Church Slavonic and Old Church Slavic. The term Old Bulgarian (German: Altbulgarisch) is the only designation used by Bulgarian-language writers. It was used in numerous 19th-century sources, e.g. by August Schleicher, Martin Hattala, Leopold Geitler and August Leskien, who noted similarities between the first literary Slavic works and the modern Bulgarian language. For similar reasons, Russian linguist Aleksandr Vostokov used the term Slav-Bulgarian. The term is still used by some writers but nowadays normally avoided in favor of Old Church Slavonic. The term Old Macedonian is occasionally used by Western scholars in a regional context. The obsolete term Old Slovenian was used by early 19th-century scholars who conjectured that the language was based on the dialect of Pannonia. ^ Hammarström, Harald; Forkel, Robert; Haspelmath, Martin, eds. (2017). "Church Slavic". Glottolog 3.0. Jena, Germany: Max Planck Institute for the Science of Human History. ^ Malkiel 1993, p. 10. ^ Waldman & Mason 2006, p. 752: "There is disagreement as to whether Cyril and his brother Methodius were Greek or Slavic, but they knew the Slavic dialect spoken in Macedonia, adjacent to Thessalonika." ^ Cizevskij 2000, p. 27. ^ After the Slavs invaded it. Curta 2006, p. 214: "At the emperor's request, Constantine and his brother started the translation of religious texts into Old Church Slavonic, a literary language most likely based on the Macedonian dialect allegedly used in the hinterland of their home-town, Thessalonica." ^ Alexander 2005, p. 310. ^ Price, Glanville (2000-05-18). Encyclopedia of the Languages of Europe. ISBN 9780631220398. ^ Parry, Ken (2010-05-10). The Blackwell Companion to Eastern Christianity. ISBN 9781444333619. ^ Rosenqvist, Jan Olof (2004). Interaction and Isolation in Late Byzantine Culture. ISBN 9781850439448. ^ Gasparov, B (2010). Speech, Memory, and Meaning. ISBN 9783110219104. ^ Lunt 2001, p. 15–6. ^ Huntley 1993, pp. 126–7. ^ Huntley 1993, pp. 127–8. ^ Syllabic sonorant, written with jer in superscript, as opposed to the regular sequence of /r/ followed by a /ь/. ^ a b Huntley 1993, p. 133. ^ Ertl, Alan W (2008). Toward an Understanding of Europe. ISBN 9781599429830. ^ Kostov, Chris (2010). Contested Ethnic Identity. ISBN 9783034301961. ^ Zlatar, Zdenko (2007). The Poetics of Slavdom: Part III: Njego. ISBN 9780820481357. ^ Lunt 2001, p. ??. ^ Vlasto 1970, p. 174. ^ Fortson, Benjamin W (2009-08-31). Indo-European Language and Culture. ISBN 9781405188968. ^ Birnbaum, Henrik; Puhvel, Jaan (1966). Ancient Indo-European Dialects. ^ Sussex & Cubberley 2006, p. 43. ^ "Razmyshlenija o makedonskom "sreze"... - I. Kaliganov". kroraina.com. ^ See: "American contributions to the Tenth International Congress of Slavists", Sofia, September 1988, Alexander M. Schenker, Slavica, 1988, ISBN 0-89357-190-3, p. 47. ^ Crampton 2005, p. 15. ^ Metzger, Bruce Manning; Metzger, Collard Professor of New Testament Emeritus Bruce M (1977). The Early Versions of the New Testament. ISBN 9780198261704. ^ Sussex & Cubberley 2006, p. 64. ^ Kamusella 2008, p. ??. ^ Birnbaum 1991, p. 535. ^ Curta 2006, p. ??. ^ Hussey, J. M (2010-03-25). The Orthodox Church in the Byzantine Empire. ISBN 9780191614880. ^ Stolz, Titunik & Doležel 1984, p. 111: "Specific phonological and lexical differences led Jagić (and many others after him, notably Vaillant) to distinguish carefully between the Western (or Macedonian) OCS of the glagolithic manuscripts and the Eastern (or Bulgarian) OCS of the Suprasliensis…"
^ Vlasto 1970, p. 169. ^ Lunt 2001, p. 4. ^ Cubberley 2002, p. 44. ^ The definite article in contemporary standard Bulgarian, Gerald L. Mayer, Freie Universität Berlin. Osteuropa-Institut, Otto Harrassowitz, 1988, p. 108. ^ Marti 2012, p. 275: "[T]he first printed book in Cyrillic (or, to be more precise, in Bosančica)…"
^ Cleminson, Ralph (2000). Cyrillic books printed before 1701 in British and Irish collections: a union catalogue. British Library. ISBN 9780712347099. ^ Nandris 1959, p. 2. ^ Kamusella 2008, p. 34. ^ A. Leskien, Handbuch der altbulgarischen (altkirchenslavischen) Sprache, 6. Aufl., Heidelberg 1922. ^ A. Leskien, Grammatik der altbulgarischen (altkirchenslavischen) Sprache, 2.-3. Aufl., Heidelberg 1919. ^ Cizevskij 2000, p. 26. ^ a b Birnbaum, Henrik (1974). On Medieval and Renaissance Slavic Writing. ^ The Universal Cyclopaedia. 1900. ^ Иванова-Мирчева 1969: Д. Иванова-Мнрчева. Старобългарски, старославянски и средно-българска редакция на старославянски. Константин Кирил Философ. В Юбилеен сборник по случай 1100 годишнината от смъртта му, стр. 45-62. Alexander, June Granatir (2005). "Slovakia". In Richard C. Frucht, ed., Eastern Europe: An Introduction to the People, Lands, and Culture, Volume 2: Central Europe, pp. 283–328. Santa Barbara, CA: ABC-CLIO. ISBN 978-1-576-07800-6. Birnbaum, Henrik (1991). Aspects of the Slavic Middle Ages and Slavic Renaissance Culture. New York, NY: Peter Lang. ISBN 978-0-820-41057-9. Cizevskij, Dmitrij (2000) . Comparative History of Slavic Literatures. Nashville, TN: Vanderbilt University Press. ISBN 978-0-826-51371-7. Crampton, R. J. (2005). A Concise History of Bulgaria (2nd ed.). Cambridge: Cambridge University Press. ISBN 978-0-521-61637-9. Cubberley, Paul (2002). Russian: A Linguistic Introduction. Cambridge: Cambridge University Press. ISBN 978-0-521-79191-5. Huntley, David (1993). "Old Church Slavonic". In Bernard Comrie and Greville G. Corbett, eds., The Slavonic Languages, pp. 125–187. London: Routledge. ISBN 978-0-415-04755-5. Kamusella, Tomasz (2008). The Politics of Language and Nationalism in Modern Central Europe. Basingstoke: Palgrave Macmillan. ISBN 978-0-230-29473-8. Lunt, Horace G. (2001). Old Church Slavonic Grammar (7th ed.). Berlin: Mouton de Gruyter. ISBN 978-3-110-16284-4. Malkiel, Yakov (1993). Etymology. New York: Cambridge University Press. ISBN 9780521311663. Marti, Roland (2012). "On the creation of Croatian: The development of Croatian Latin orthography in the 16th century". In Susan Baddeley and Anja Voeste, eds., Orthographies in Early Modern Europe, pp.269–320. Berlin: De Gruyter Mouton. ISBN 978-3-110-28817-9. Nandris, Grigore (1959). Old Church Slavonic Grammar. London: Athlone Press. Stolz, Benjamin A.; Titunik, I. R.; Doležel, Lubomír, eds. (1984). Language and Literary Theory: In Honor of Ladislav Matejka. Ann Arbor, MI: University of Michigan Press. ISBN 978-0-930-04259-2. Sussex, Roland; Cubberley, Paul (2006). The Slavic Languages. Cambridge Language Surveys. Cambridge: Cambridge University Press. ISBN 978-1-139-45728-6. Tóth, Imre H. (1996). "The Significance of the Freising Manuscripts (FM) for Slavic Studies in Hungary". Zbornik Brižinski spomeniki. Ljubljana: Slovenska akademija znanosti in umetnosti. pp. 443–448. Vlasto, A. P. (1970). The Entry of the Slavs into Christendom: An Introduction to the Medieval History of the Slavs. Cambridge: Cambridge University Press. ISBN 978-0-521-07459-9. Waldman, Carl; Mason, Catherine (2006). Encyclopedia of European Peoples, Volume 2: M–Z. Facts On File Library of World History. New York, NY: Facts On File. ISBN 978-1-438-12918-1. Wikimedia Commons has media related to Old Church Slavonic. Vittore Pisani, Old Bulgarian Language, Sofia, Bukvitza, 2012. English, Bulgarian, Italian. This page was last edited on 20 April 2019, at 16:34 (UTC).